Screenshot of Twitter.com featuring a tweet by Saber. When Saber sees something wrong in the world, he tweets about it. He tweets links to relevant news articles and tweets his outrage and does all the things that most of us do. But sometimes he goes one step further. 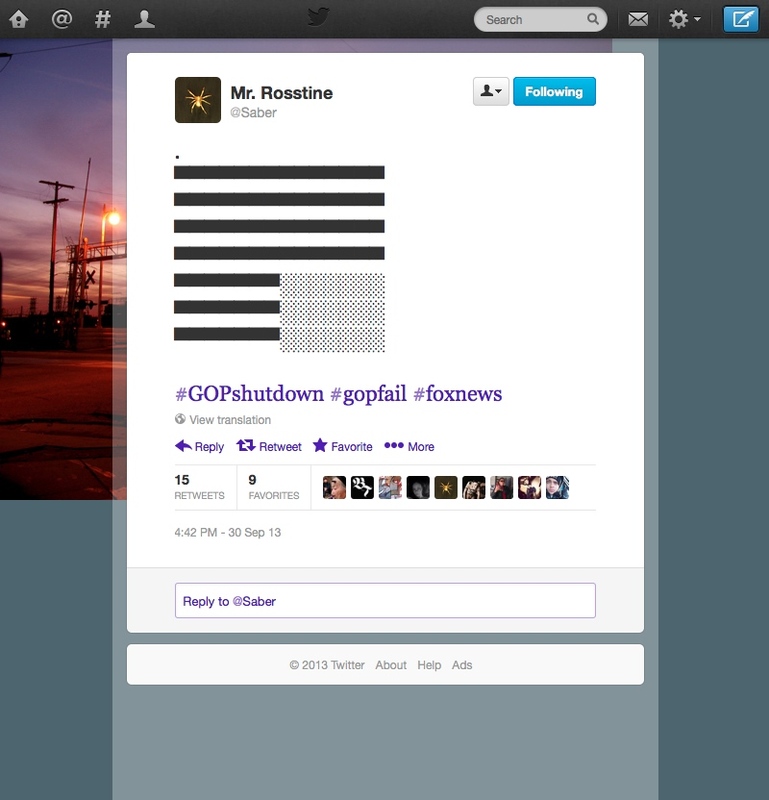 In those instances, he tweets an upside down American flag made from ASCII characters. By using odd characters to make a rough representation of a flag rather than tweeting a JPEG image, the flag is displayed in the tweet itself and you don’t have to click anything to see it no matter what platform you are using to read tweets (although in late 2013, Twitter did modify the site so that even JPEGS are displayed automatically if they are uploaded through Twitter). It’s just their in your feed. Simple organic viral art, right? Saber takes things a step further, into a grey area between organic and invasive viral art. He adds hashtags to his flag tweets to reference whatever he’s alarmed about. If he uses #GOP in a flag tweet for example, anyone searching the #GOP hashtag around that time is confronted with Saber’s upside down flag. Because Saber has over 18,000 Twitter followers, his flag tweets get retweeted and make their way to the top of the search result pile for any of the hashtags that he uses. He often accompanies the flags and the news or organization-specific hashtags with hashtags like #lies that make his thoughts on the topic more clear to those who might just come across the tweet randomly. Saber could just tweet the flags along with a comment like “I hate Verizon for cooperating with the NSA to spy on Americans,” but thanks to the hashtags, the flags start appearing in places where they “shouldn’t,” invading conversations and brand identities that would rather not have negative feedback voiced so publicly or so loudly. #verizon is a kind of digital real estate for Verizon, but Saber can take over those spaces. When the flags are initially tweeted and when they are retweeted, they are organic viral art, but they become invasive viral art when they’re discovered by users who are searching the various hashtags Saber uses. It’s a brilliant way of reaching out to a digital public with art and simultaneously infiltrating the digital real estate of others, a kind of graffiti for Twitter. There are a handful of other artists making art on Twitter and I don’t mean to say that Saber is entirely unique with what he is doing, but I find Saber particularly interesting for three reasons. First, the hashtags do set him apart somewhat as an artist infiltrating streams rather than just ending up on streams more organically. Second, his work is more accessible than many other artists making work on Twitter. The average Twitter user who isn’t particularly interested in the intricacies of the web probably isn’t going to have the same understanding of or appreciation for an account like @glitchr_ as they will Saber’s iconic upside down flags. Without that accessibility, art on Twitter gets trapped in the same pitfalls of first generation internet art. Thirdly, Saber comes from graffiti, so it just seems to make more sense to focus on him in a book about bridging the physical/digital divide rather than artists like Dion Matta, Matthew Haggett or Guy Vincent.